Explant Processing: Full thickness cartilage slices are selected for explant production. Each explant is created with a biopsy punch, 3mm in diameter. Upon request, explants up to 6 mm may be available. All explants in a culture plate have uniform circumference. 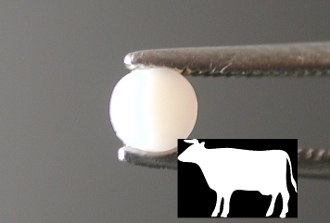 The thickness can vary, usually between 0.5 and 1 mm. Explants are distributed into multi-well plates or in bulk format in media supplemented with 10% FBS. The cultures are shipped overnight with cold packs. Histology Service: A cartilage explant will be formalin-fixed, paraffin embedded and sectioned into slices 5 microns thick. Two unstained slides and one stained with H&E will be provided. Additional shipping required.